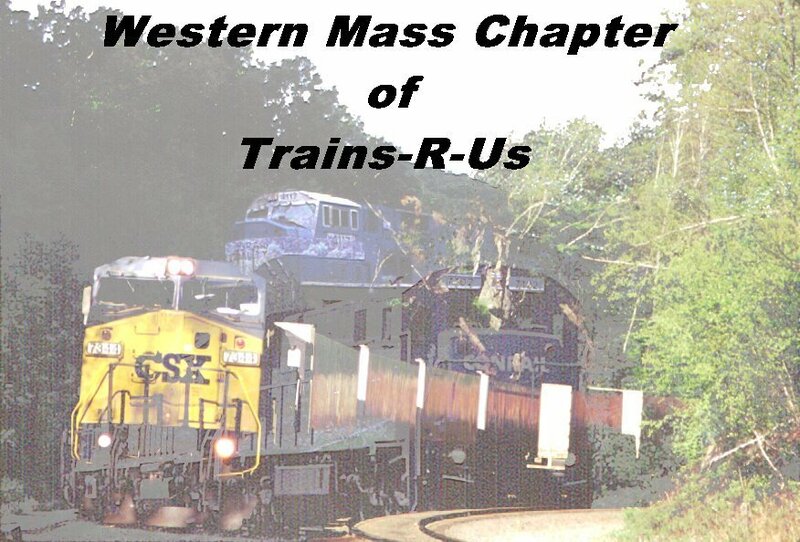 Western Mass Chapter of "Trains R Us"
Thanks for stopping by the new "Trains R Us" Home Page. This page deals with CSX throughout Western Mass and New York State. It is my hope to keep updated info on CSX operations in Mass (Boston Line) with foreign power sightings, AC powered units, latest news, maps and other helpful info for the railfan wishing to visit or just be informed about whats happening with CSX in New England. CSX operates 20-22 trains daily with TOFC/COFC and mixed freight. Two Amtraks trains, 448/449 operate daily along with Ballast extras and lite power moves. For those wishing to catch some of the TOFC/COFC/Stack trains that operate over this line, CSX trains Q113, Q114, Q115, Q116, Q117, Q119 handling stacks with the Q116 and Q119 your best bets during daylight. CR's old workhorses of the B&A the C30-7A's once ruled the hill but all have been either retired or sold off. The SD80 MACS which also handled alot of the traffic still make some appearances but for the most part they operate systemwide with the exception to several pairs assigned to the coal drags between Cumberland, MD and Benning, Md. As of late August, 2000 CSX mangement had decided to assign 40+ GE AC 6000 units (600-5015) to B&A general freights operating in pairs in much the same way Conrail operated the SD80 MACS over the hill. During the last half of 2003 and into 2004 CSX purchased from EMD the SD70MAC's 4701-4775 with a additional 50 #'4776-4830 to be coming online late 2004. Along with that CSX has purchased a additional 20 SD70ACE's #'s4831-4850, delivery date as of this writing was unknown. A visit to the hill these days will get you the CSX AC6000's, SD70MAC's along with pairs of x-CR C40-8's and sometimes a SD60i, along with anything else coming in from trains that operate from the western end of the CSX system. If you have anything you wish to add just drop a line to me and I will add it to the page with proper credit listed.